I thought it might be of interest to prosecutors who write software patent applications that one of the claims at issue in yesterday’s Oracle v. Parallel Networks, 2009-1183 (Fed. Cir. April 28, 2010) decision concerned a Beauregard claim. Perhaps the Federal Circuit has had a chance to review other Beauregard claims; but, other than in Ariba v. Emptoris, 2009-1230 (Fed. Cir. Jan. 8, 2010) this is the only one that I’ve noticed. dynamically generating a Web page, said Web page including data retrieved from one or more data sources. ’554 patent col.10 ll.24–41 (emphases added). All asserted claims have the “releasing” limitation, the “intercepting” limitation, and the “dispatching” limitation. The link to the court’s opinion is available here: [Link]. In addition to failing to compare the preliminary amendment to the initial parent disclosure, the Board appears to have applied the wrong standard in determining that the incorporation language was confusing. The disputed continuation application is at the initial filing stage, where the examiner is first presented with an original disclosure and a preliminary amendment. The proper standard by which to evaluate the sufficiency of incorporation by reference language, at this stage of the proceedings, is whether the identity of the incorporated reference is clear to a reasonable examiner in light of the documents presented.2 In other words, the relevant inquiry is whether a reasonable examiner would be so befuddled by the language of the original disclosure, despite the explanation provided in the transmittal and preliminary amendment, that he could not determine what document was intended to be incorporated by reference. See In re Fouche, 439 F.2d 1237, 1239 (CCPA 1971); see also 37 C.F.R. § 1.57(g)(2). During oral argument, the panel also discussed the “befuddlement” or lack thereof by the examiner: [Listen]. Where do you draw the line between “common sense” and hindsight? Electronic check processing is a quickly developing field that is becoming the subject of an increasing number of patent applications. The non-obviousness of one such application (assigned to a government charter organization, the Federal Reserve Bank of Dallas) was the subject of oral argument recently in In re Schreck, 2009-1569 (Fed. Cir. April 12, 2010). Judge Plager also chimed in by commenting to appellant’s counsel “Don’t you think it’s nice that this court [the Federal Circuit] is now understood to have “common sense” as well as familiarity with the law?” [Listen]. You can see the Rule 36 opinion here: [Read]. Edward C. DuMont has been nominated to fill the vacancy at the United States Court of Appeals for the Federal Circuit when Chief Judge Paul Michel retires from the bench at the end of May. I could not find any recordings of Mr. DuMont arguing before the CAFC; however, you can listen to this recording of Mr. DuMont arguing before the Supreme Court in Hercules, Inc. et al. v. United States, 516 U.S. 417 (1996): [Listen]. The case concerned whether chemical manufacturers could recover from the United States their costs incurred defending Agent Orange tort claims. Mr. DuMont has argued eighteen cases before the Supreme Court of the United States. On April 14th, 1865, John Wilkes Booth shot and fatally wounded Abraham Lincoln. 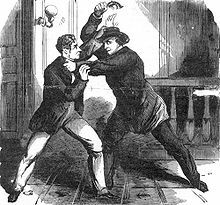 That same evening, a co-conspirator of Booth’s attempted to assassinate Lincoln’s Secretary of State, William H. Seward. 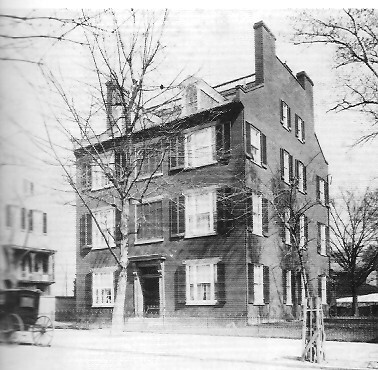 Seward was living at the time in a house (now demolished) at 17 Madison Place. 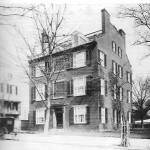 That address would later be re-designated as 717 Madison Place, where the building for the Court of Appeals for the Federal Circuit now resides. Seward’s attacker was Lewis Powell. Powell gained access to the house under the ruse of delivering medicine to Seward who was recovering from a carriage accident. After first struggling with Seward’s son and critically injuring him, Powell stabbed Seward several times with his Bowie knife before fleeing the house. It is thought that Seward’s jaw splint from his carriage accident prevented a fatal blow during the attack. Powell was apprehended the following day and later executed along with other Lincoln assassination conspirators. Seward recovered from his wounds and would later successfully negotiate the purchase of Alaska from Russia for $7.2 million on March 30, 1867. Deference to the district court out of respect for judicial economy? In Hearing Components, Inc. v. Shure, Inc., 2009-1364 (Fed. Cir. April 1, 2010), Judges Rader, Schall, and Lourie explored when it would be appropriate to defer to a district court judge’s handling of issues in order to enhance the district court’s docket management. The issue was raised by Judge Rader who is currently sitting by designation at the district court level and presiding over some patent cases in the Eastern District of Texas. Essentially, Judge Rader seemed to be inquiring whether it would be appropriate to defer to the district court judge on a claim construction issue when it is apparent that the district court judge was using the claim construction to expeditiously dispose of a less important patent so that the district court judge could devote more resources toward a more important patent in the litigation. You can listen to the judges’ comments here: [Listen]. In addition to the statutory language and Supreme Court precedent supporting the existence of a written description requirement separate from enablement, stare decisis impels us to uphold it now. Ariad acknowledges that this has been the law for over forty years, see Appellee Br. 24, and to change course now would disrupt the settled expectations of the inventing community, which has relied on it in drafting and prosecuting patents, concluding licensing agreements, and rendering validity and infringement opinions. As the Supreme Court stated in admonishing this court, we “must be cautious before adopting changes that disrupt the settled expectations of the inventing community.” Festo, 535 U.S. at 739; see also Watson v. United States, 552 U.S. 74, 82 (2007) (“A difference of opinion within the Court . . . does not keep the door open for another try at statutory construction, where stare decisis has special force [since] the legislative power is implicated, and Congress remains free to alter what we have done.” (internal quotations omitted)). If the law of written description is to be changed, contrary to sound policy and the uniform holdings of this court, the settled expectations of the inventing and investing communities, and PTO practice, such a decision would require good reason and would rest with Congress. While it is reassuring to know that the en banc panel of the Federal Circuit appreciates the importance of not disrupting the settled expectations of the inventing community, one wonders if this is more sizzle than steak. (1) Take for example the cases of Dayco Prod., Inc. v. Total Containment, Inc., 329 F.3d 1358 (Fed. Cir. 2003) and McKesson Info. Solutions, Inc. v. Bridge Med., Inc., 487 F.3d 897 (Fed. Cir. 2007) in which the Federal Circuit seemingly failed to appreciate the long-accepted practice by the inventing community of not citing office actions from related patent applications back to the Patent Office (the same Patent Office that issued the office actions in the first place). In those cases, the Federal Circuit certainly disrupted the settled expectations of the inventing community by casting a cloud over the validity of many issued U.S. patents. As a kicker, the U.S. Patent Office, already struggling with a massive backlog, has been burdened with processing additional IDS filings that waste the Patent Office’s resources and applicants’ money. (2) As another example, consider the use of patent abstracts by the Federal Circuit to construe claim language. Prior to the amendment of 37 CFR §1.72 this past decade, 37 CFR §1.72 expressly stated that the abstract of a patent “shall not be used for interpreting the scope of the claims.” Abstracts are required by the PTO to assist the PTO and the public generally in determining quickly from a cursory inspection of a patent application or issued patent the nature and gist of the technical disclosure. Citing 37 C.F.R. § 1.72(b), which provides that the abstract of the patent “shall not be used for interpreting the scope of the claims,” Hill-Rom argues that it would be improper for us to consider the abstract in determining whether the district court correctly construed the claims of the ‘346 patent. Section 1.72(b), however, is a rule of the Patent and Trademark Office that governs the conduct of patent examiners in examining patent applications; it does not address the process by which courts construe claims in infringement actions. We have frequently looked to the abstract to determine the scope of the invention, see, e.g., United States Surgical Corp. v. Ethicon, Inc., 103 F.3d 1554, 1560, 41 USPQ2d 1225, 1230 (Fed. Cir. 1997); Stryker Corp. v. Intermedics Orthopedics, Inc., 96 F.3d 1409, 1412, 40 USPQ2d 1065, 1066 (Fed. Cir. 1996); Moleculon Research Corp. v. CBS, Inc., 793 F.2d 1261, 1269, 229 USPQ 805, 810 (Fed. Cir. 1986), and we are aware of no legal principle that would require us to disregard that potentially helpful source of intrinsic evidence as to the meaning of claims. The selective acknowledgement of Patent Office regulations by the Federal Circuit certainly does not indicate a respect for the settled expectations of the inventing community. (3) Perhaps the strongest trend these days is for the Federal Circuit to rely heavily on the language “the invention” or “the present invention” when construing a claim. Such language has been used for aeons in patents. Nevertheless, in the last decade or so, the court has been relying on this language with increasing frequency to read limitations into a claim. In doing so, it failed to take into account the long-settled expectations of the inventing community as well as the significant effect on the construction of claim language in issued patents written as many as twenty years earlier. Please pardon the brief digression; but, it is that time of the year when your local Science Fair is scrambling for judges. Science Fair judging is a great opportunity for patent lawyers to use their skill sets to give back to the community in a small way. You are currently browsing the 717 Madison Place blog archives for April, 2010.